The growing income disparity in the United States is reviving talk about class struggle and class war, not in a Marxist context, but rather from the perspective discussed as far back as Aristotle and from within such unimpeachable American sources as James Madison’s Federalist 10. Given that this subject is not likely to go away any time soon, what light might an emergent order informed perspective shed on the subject? Class struggle is simply one form that we see in the eternal tensions between emergent orders and the teleological organizations that at any given moment have risen to success within them. Essentially by definition in any spontaneous order successful organizations will possess more systemic resources than will potential competitors. These resources can be used to either adapt to change or to try and control it. Older organizations appear to prefer control over adaptation. This is obviously true in the cases of democracies and markets. A weak version of this appears in science as dominant schools of thought not only give preference to their own, they actively seek to eliminate alternative approaches, as anyone with much academic experience well knows. In the market the most successful will seek to manipulate it either from within or through political intervention to secure and enhance their status. Given that the market’s systemic resource – money – translates into resources in democracies – such as funding campaigns – the temptation to seek enhanced privileges through government is intrinsic once an organization chooses control over adaptation. The rich and well to do, as a class, will consistently seek to control the government and the market to stabilize their ascendancy. Those poorer in systemic resources, especially money, will be at a disadvantage. I will give two examples from my own area of greatest policy passion: the environment. Further, timber sales are organized to make it almost impossible for local logging companies to compete because the parcels are very big and very far apart. They systematically privilege big companies. The alternative of frequent sale of small adjacent parcels enabling local logging companies to compete does not happen very often. What we find is forestland managed primarily for the benefit of large timber companies. For another example, as more and more people wanted organic food, different states began enacting organic standards for food sold within their borders. These standards reflected local preferences. Seeing a potential large national market without a need to adapt to local preferences if state standards could be eliminated, national food corporations succeeded in getting national standards established that prevented any more demanding state standards. This accomplishment provided two advantages to the current elite. First, the market was forcibly standardized, giving giant companies an advantage over smaller competitors. Often these measures would not be favored by local producers for more than economic reasons. Second, by centralizing control over standards, thereby requiring more resources to have a voice in their content, corporations could more easily seek to manipulate those standards downward, as they have done since. In both cases the have-mores benefited at the expense of those-who-had-less. As I studied American history, starting out as a libertarian-conservative, I was increasingly impressed with how large a role big business has played in centralizing political power as far away from individuals as possible. They have done so because in the process they strengthen their own positions. Locally the same patterns develop, except that the manipulators are local established businesses. The issue is not primarily size, although size makes the impact worse, but the organization’s perceived relationship to spontaneous order processes. Sometimes businesses undercut one another, and sometimes there are small movements in the opposite direction, as with airline deregulation of prices, a deregulation opposed by most airlines, but the over-all pattern is robust. The same deregulating current that led to price deregulation in airlines led to Savings and Loans “deregulations” that led to a crisis that in turn led to the largest shift of money from the less well-off to the more well-off in history until our current situation. There is a even more worrisome dimension to this process. If my interpretation of Hayekian reasoning is sound, two additional patterns should be developing, and at the moment they appear to be. First, once the dominant class has gained sufficient leverage, it will rapidly increase the percentage of wealth it controls because doing so adds to its security. 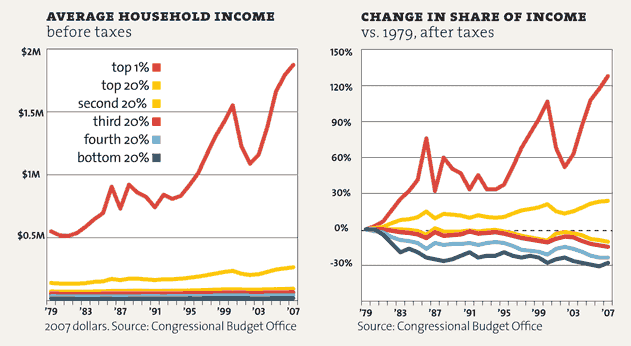 The graphs of growing inequality and concentration of wealth in the US is troubling. Secondly, in the process innovation will be hindered as opportunities for creative entrepreneurship become stifled. That other countries are moving ahead in industries that would be challenging dominant long-established American industries suggests (but does not prove) this is so. Anyone paying much attention to public policy can come up with more examples, from tweaking copyright laws to preserve monopolies to arranging subsidies, no-bid contracts, cost-plus contracts, bail outs, too-big-to-fail and many other examples. James Madison’s concern that disputes over property had afflicted and undermined all relatively free societies in the past has proven as true today as ever before. The cure he suggested in Federalist 10 has largely broken down. His insights have been largely ignored or misinterpreted because of the exclusive focus on Marxist conceptions of class war compared to a supposed class harmony by Communism’s opponents. Today this far older and better grounded tradition of understanding class divisions, one extending from Aristotle through our own Founders and beyond, is finding renewed relevance. The distinction Hayek drew between spontaneous orders and organizations helps us understand some of the structural causes for this problem. With better understanding we might find measures to restore the health of spontaneous order processes where they have been crippled by too much power held by the dominant organizations within them.